Thank Mary, Moses and Baby Jesus…Kurt Geiger have only gone and bloody launched accessories! I must bid a reluctant fairwell to my mortgage and say a big hello to my new accessories collection. This new collection of amazing accessories is exclusively available to buy online on the new-look kurtgeiger.com* and also in their new boutique on Grafton Street, Mayfair. The range cleverly titled ‘Everything But The Dress’ will hit Kurt Geiger stores nationwide on the 6th September. Everything But The Dress from Kurt Geiger on Vimeo. ‘Everything But The Dress’ holds a little and a lot of something for everyone. A range of very reasonably priced jewellery, hair accessories, key fobs, laptop cases, ipad cases and much more is displayed in gold foil bubble packaging on a stand which resembles that of a very girlie candy store! As us ladies are drawn to all things shiny your inner magpie will certainly feel overwhelmed at the choice and variation on offer of this range suitably named ‘Candy’. There’s nothing in the ‘Candy’ collection that costs more than £55, but don’t think for a minute that this compromises on quality. All jewellery is either Gold Plated or Heamatite plated so you won’t be left with those horrible green fingers. I urge you to visit the store on Grafton Street (pictured below) to check everything out! The atmosphere of the store in itself is just like a playground for women, you are encouraged to touch, feel and try on the goods! I guarantee you’ll come out with bags full of the stuff! On the flip side, there’s also a collection of higher end jewellery, stunning leather goods and outerwear accessories. One item sure to be a ‘sell-out’ is the green nubuck ‘Humbug’ clutch bag (Below – £170)…get me one now!!! I purchased this cute snake travel card holder – £12! 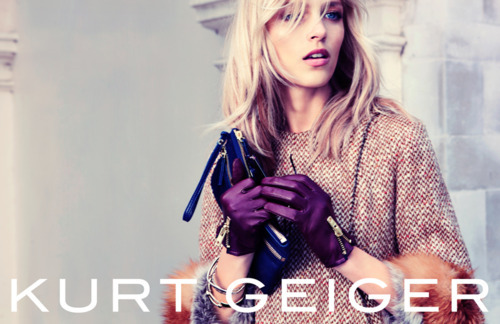 *The new Kurt Geiger website now ships internationally!